I have written some blog posts about consuming Windows Azure Service Management API using C#. I have been quite active on StackOverflow trying to answer some questions about Windows Azure. Recently I observed a number of questions there asking for consuming this API through Java. Also somebody approached me asking for something like this. This blog post is a result of that. In this post, I will talk about how one can consume this API using Java. Its been ages that I have worked with Java so things I describe below may sound trivial to experienced Java developers so please bear with me . Also if there’re better ways to do things, please let me know as most of the code you will see below would be the result of massive Internet searches . Let’s take a moment to talk briefly about what this API is and some other fundamental things about it and then we’ll get into the code. Windows Azure Service Management API is a REST based API for managing Windows Azure resources. Using this API, you can manage your cloud services, storage accounts, virtual machines, virtual networks and lot more. 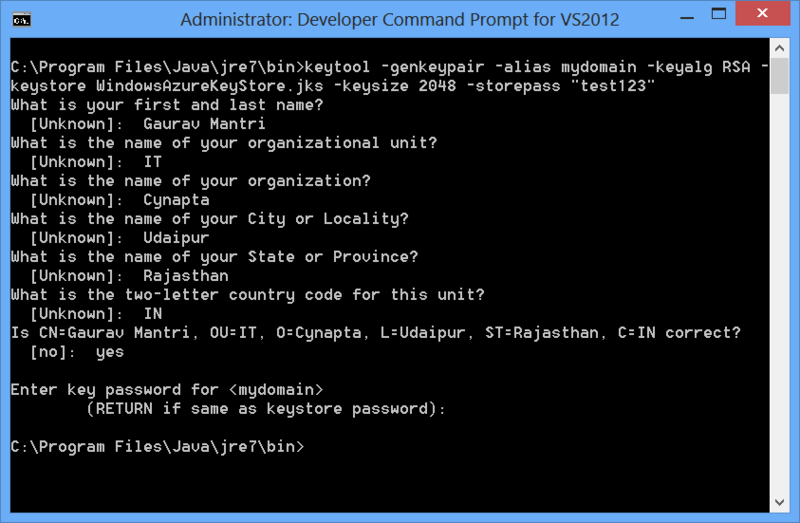 Essentially the things you could do on Windows Azure Portal can be done through this API. In fact, Windows Azure Portal is built on top of this API. You can learn more about this here: http://msdn.microsoft.com/en-us/library/windowsazure/ee460799.aspx. Subscription Id: This is a GUID which uniquely identifies your subscription. You can get this information through portal. Management Certificate: A management certificate is required to authenticate your API calls. This management certificate must be associated with your subscription which you can do by upload the certificate in the portal. You could either create a management certificate on your own and associate it with your subscription (this is covered in details in this post) or you could ask Windows Azure platform to create a management certificate for you and associate it with your subscription. This is done through a process called “Download Publish Profile File”. I have written a blog post about it some days back which you can read here: https://gauravmantri.com/2012/09/14/about-windows-azure-publish-settings-file-and-how-to-create-your-own-publish-settings-file/. Since the API is a REST based API, the endpoints are accessible over HTTP. In your code, you create an endpoint specific to a particular kind of operation you want to perform. Then you create an HTTP request for that endpoint. To authenticate the request, you attach the management certificate along with that request. You can learn more about the authentication here: http://msdn.microsoft.com/en-us/library/windowsazure/ee460782.aspx. Now that we know a bit about the API, let’s look at how we can consume this API using Java. I will not go into details about consuming this API using the publish profile file as it is covered extremely well by Andy Cross and Richard Conway in their Elastacloud blog post: http://blog.elastacloud.com/2012/09/29/a-windows-azure-service-management-client-in-java/. If this is something you’re looking for, stop reading this post and head over to their website otherwise read on . Rest of this post will cover how you could consume this API by creating your own management certificate. There are some things you would need to do first. 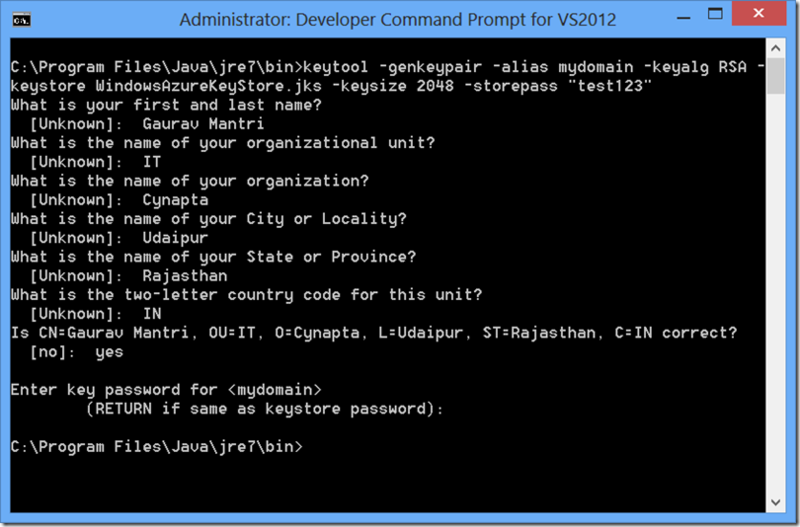 What we’ve done is created a Keystore called “WindowsAzureKeyStore.jks” and set the password to access this as “test123”. 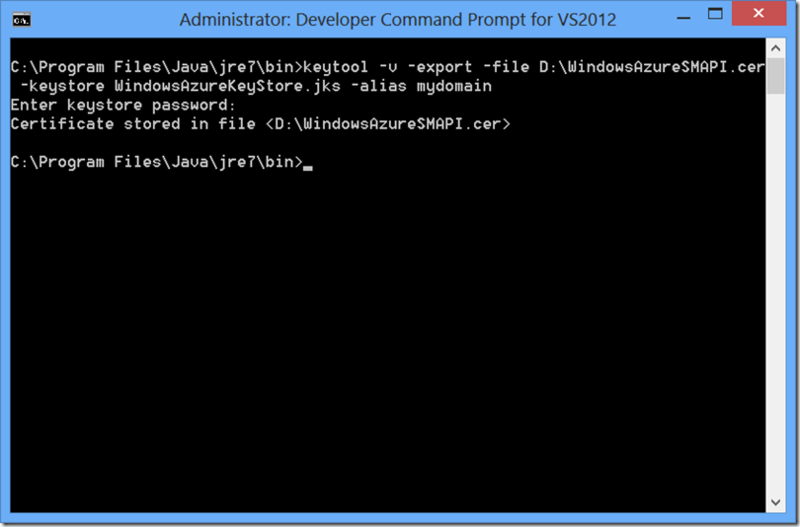 You should see a file called “WindowsAzureKeyStore.jks” in “C:\Program Files\Java\jre7\bin” folder. Once this operation completes, I will get a “WindowsAzureSMAPI.cer” file in “D:\” of my computer. Next step is to upload this certificate to the Windows Azure Portal. To do so, login into Windows Azure Portal at https://manage.windowsazure.com and click on “SETTINGS” tab and then go to “MANAGEMENT CERTIFICATES” tab and upload this “WindowsAzureSMAPI.cer” file there. Now we’re ready to code . Once we have this, all we have to do is execute HTTP requests. Using this URL, create an instance of HttpsUrlConnection object and set SSLSocketFactory. That’s pretty much to it! This is based on the documentation here: http://msdn.microsoft.com/en-us/library/windowsazure/gg441293.aspx. This makes use of “processGetRequest” helper function. You can then simply parse the XML to get desired information. This is based on the documentation here: http://msdn.microsoft.com/en-us/library/windowsazure/gg441304.aspx. This makes use of “processPostRequest” helper function. If the request process properly, you should get back 201 as “responseCode”. Since the code above required me to convert a string into Base64 format, I made use of “apache.common.codecs” which you can download from here: http://commons.apache.org/proper/commons-codec/download_codec.cgi. This is based on the documentation here: http://msdn.microsoft.com/en-us/library/windowsazure/gg441305.aspx/. This makes use of “processDeleteRequest” helper function. If the request process properly, you should get back 200 as “responseCode”. As I told you above I haven’t worked with Java in ages and I had to search through many Internet sites to get the information I wanted. StackOverflow obviously had been a great help however one site I want to mention in particular is http://www.mkyong.com. This site has some really helpful blog posts on Java. That’s it for this post. I hope you will find this information useful. As always, please let me know if I have made any mistakes and I will correct them ASAP.